Are you thinking about hiring a landscaping company, but have no idea what it’ll cost? Let’s take a look at what you should budget for your project. One of the most common questions we get is from homeowners who aren’t sure how much they should set aside for their landscape design or installation. Many people have never hired a contractor for one of these services before. If that’s you, then you’re probably wondering how much landscaping costs. Sorry! I know that’s not very helpful, but I promise I’ll get to some specific numbers in a moment. What I want to preface all of this information with is the fact that landscaping prices can vary dramatically. How intricate the plantings are. The size and materials used for patios, walkways, and retaining walls. The varying costs of specific plants and mulches. Additional features such as rainwater catchment, greywater systems, benches, planter beds, etc. The Landscaper’s labor rate and overhead expenses. The landscaper’s expertise and construction methods. Added value provided by the landscaper such as follow up visits, additional consultations, and landscape care training. Those are just a few of the factors that will influence the final price of your landscaping project. When getting estimates or bids for your project, keep in mind that the more information the landscaper has about your specific needs, the more accurate they will be when presenting the job cost to you. In order to narrow down the price ranges in this article, I’m going to focus mostly on the costs for average sized residential properties. If your property is larger than average keep in mind that the size of the landscape area alone is a major factor in how much it will cost, and be sure to adjust for that when considering the price ranges below. Residential lawn conversions – where the lawn is converted into drought-tolerant landscaping – are very popular. The typical lawn conversion project is at homes with a front or back lawn that is anywhere from 1,000 square feet to 2,000 square feet. We’ve found that these projects average on the low end around $10,000, on up to $15,000 or more for a basic conversion to drought-tolerant landscaping. That includes physical removal of the lawn, sheet mulching to build soil health, a decomposable weed barrier (if needed), a professionally designed planting with California natives or climate adapted plants, soil amendments, a layer of premium mulch, replacing the sprinkler system with drip irrigation, and usually some boulders and a specimen tree. One thing to note here is that with lawn removal rebates, you can get up to $2/ square foot back from your city or the state. In San Luis Obispo, for example, there is no city rebate at this time. However, you will most likely be eligible for a REBATE FROM THE STATE OF CALIFORNIA. If so, you can get up to $2,000 back! Not bad, especially since you only have to remove 1,000 square feet of turf to receive the maximum refund. See our post HERE for more information on lawn rebates in SLO County. Again, the price depends entirely on the factors listed above, especially the size of the yard and the specific wants and needs of the client. You’ll notice that for the price I mentioned, this does not include any sort of hardscaping such as walkways, patios, or retaining walls. Let’s suppose that you want the type of project described above, but also want to include a pathway, patio, or a retaining wall. These are common hardscape elements found in landscapes. They are also some of the most expensive features. As a general rule, the harder the material, the more expensive it will be for materials and labor. For example, a decomposed granite walkway will be much less expensive than a concrete walkway. (Quick aside – decomposed granite is also permeable to water, letting it absorb into the ground instead of shedding off into storm drains. We will almost always recommend permeable surfaces over concrete or other non-permeable surfaces. I’ll save that for another article though…) This hardness rule is also true for groundcovers such as bark and river rock – the harder it is, the more it’ll cost. On average, when clients want to include a walkway or patio in their landscaping, it adds on another $2,000-$5,500 if a material such as decomposed granite is used. If the patio or walkway is made out of flagstone, it could be more like $4,000 – $8,500. For a hardscape made out of regular or permeable pavers, you might expect to pay $5,000 – $11,000. Again, these are broad numbers. It can be less or much, much more, just depends on the materials used, site conditions, and the size of the hardscape. Landscape features such as retaining walls and outdoor kitchens are also highly variable. For retaining walls, materials such as lumber and Allen Blocks will costs less than walls that require mortar and veneer work. Outdoor kitchens are often one of the most costly (but also most enjoyable) features to include in your landscape. The final price will depend mostly on what appliances are included, and what type of veneer stone and counter top is used. What the heck does that mean? Well, it’s really cool actually. This is arguably a necessary feature to include in any new California landscape. With our dry climate, it’s extremely important to maximize the potential of the rainfall that we get. In your landscape, you can utilize rainwater by redirecting your downspouts into swales created in the landscape. Swales are depressions in the earth. In landscapes they are created by digging in several inches or more to create a low spot for water to collect. They are often made in the form of a dry creek bed lined with rock. Swales can be environmental saviors in your landscape! They manage runoff, filter out pollutants, and increase rainwater infiltration into the soil. If you combine swales with native plants and healthy soil, you will have a lovely, natural looking garden that can use no artificial irrigation and will sop up the rainwater coming from your roof like a sponge, instead of letting it run off into the storm drains. This is truly sustainable landscaping! So enough of my rant, how much does it cost? 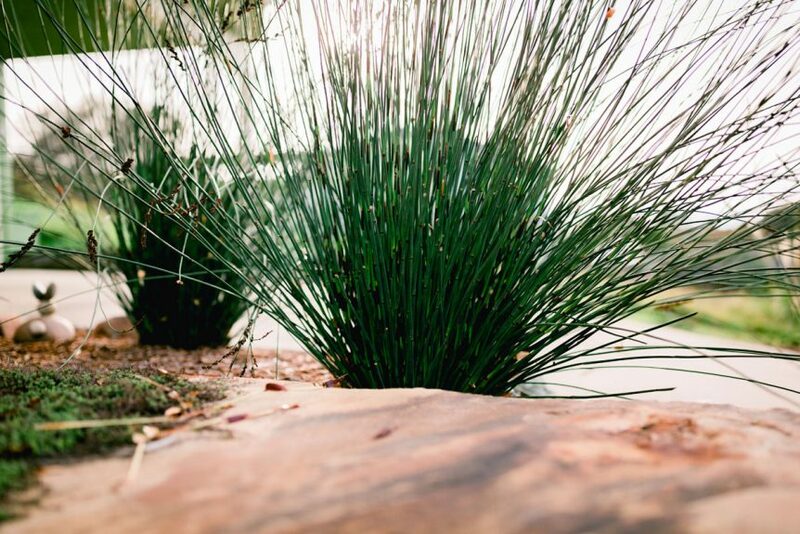 For most yards, you can expect the inclusions of rainwater catchment in the form of a natural looking, rock lined swale to add another $3,000 or more to the final cost of your landscaping. It could be way more or it could even be less depending on the size of the catchment area, yard, etc. Honestly, in my opinion it’s a small price to pay for a landscape feature that will only become more popular as people discover how important of a role it can play in the environmental well-being of California. With so much drinkable water going to landscape irrigation and the vast majority of rainwater going into storm drains and into the ocean, this needs to be included in all California yards. Plus, you’re water bill will plummet and your yard will look awesome! I suppose we should have started with this one, since it’s almost always the first step in your landscaping project. It’s also one of the most important steps. The design allows you to work with your landscaper to create a plan for your new landscape. The designer will meet with you to discuss what you would like to include in the project. What types of plants? Any specific style? Any hardscaping and if so what materials do you like? Do you want to include any extra features such as rainwater catchment, swales, benches, arbors, etc.? These are just a few questions a good designer will ask as they gather information in order to translate your ideas for your yard into a well-crafted, professionally designed landscape plan. Of course, if you simply have no idea what you want for your yard, an expert designer will make recommendations and use their creativity to deliver outstanding results. Having a full design allows you to visualize what your new landscaping will look like. You’ll know exactly what you are going to get. Going through the design process will also let you work through ideas and get clearer on what you really want for your yard. For the landscaper, a completed design allows them to give you a definitive price for the project, since all of the details such as size, materials, and features are included in the plan. So how much can you expect to pay for the design? Depending on the credentials, expertise, and methods of the designer, as well as the scope of the project, most residential clients can expect the costs to range from $1,000-$2,500 or more. A simple design for a smaller area will get you closer to that $1,000 range, while a more complex design will cost more. The cost can also depend on the format of the design. Hand drafted plans are typically more costly than digitally created plans. If you want to receive perspective images of the landscape design, that will increase the price as well. We find that our designs are typically in the $1,100 – $1,700 range, but again, it depends. One last thought about designs. You can usually have the design as a separate service from the installation. That means after you get your finished design, you can take it to any landscaper to have them install it. If the company you are working with for your design is also a landscape installation contractor, in most cases I would recommend that you stick with them for the installation. Having already gone through the design process with you, they will have the best idea as to what you want. Like any artistic creation, the design will usually have their unique style. It may include specific elements that they specialize in or plants that they have an intimate knowledge of. This means they will often do the best job when it comes to installing that particular design. 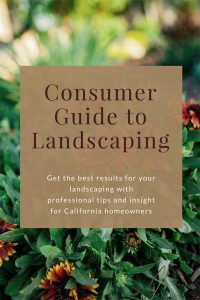 Here’s my quick summary for the question “How much does landscaping cost?” – It depends, but typically for an average sized residential front or back yard it’s anywhere from $10,000-$45,000. If your landscape includes many different features such as walls, an outdoor kitchen, a pergola, expansive patio areas, and generally has a large scope of work, or is a large sized property, you can expect to pay much more. To give you a different perspective, we have done projects ranging from $2,000 – $290,000. Sorry, I know that’s a huge range, but as I mentioned, the price can vary dramatically. There are a number of factors that ultimately determine the amount that you’ll pay. One of the factors that is most critical is your budget. If you set a realistic budget, your landscaper can often work with you to design the project around that budget. If a client comes to us and says they want to convert their lawn into a new landscape with native plants, a flagstone patio, and a dry creek bed for rainwater catchment, and they say they don’t want to spend more than $25,000, then we can work to create a landscape that won’t exceed that price. Assuming the budget is realistic for that space, knowing how much they want to spend allows us to make smart choices for materials, the intricacy of the design, and any other items that affect the cost. If you don’t have a specific budget, it still helps if you can give a budget range. Do you want to spend $5-$10K? $10-15K? $15-$20K? $20-$30K? If you’re worried that if you give a budget, the landscaper will automatically max it out, please don’t. Any honest landscaping company will treat you fairly. They can even give you price options for different features or break up the costs by doing the project in phases. Not relaying your budget to your landscaper can only make the process more difficult for everyone. Having a good idea of your budget can keep you from getting a landscape that is too expensive and can help the landscaper to give you a better experience. When you select a landscaper, you’ll choose between a wide variety of companies with different experience levels, methods, specialties, competency, and commitments to customer satisfaction – all with different price points. Typically, the largest companies with a lot of overhead expenses and many employees will be the most expensive, while the unlicensed one man show landscaper will be the cheapest. The small to medium sized companies will usually be somewhere in the middle, and you will often get greater attention to detail and more personal service with them. To get the most value, choose a company based off of who will deliver excellent results, provide a wonderful customer service experience, is trustworthy, and will stand by their work. 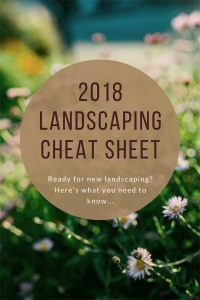 I know this article doesn’t include a comprehensive list of every type of landscaping cost, but it’s my hope that it gives you an idea of the costs associated with landscaping projects. If there’s something I missed or anything else I can do to help you on your journey to a new landscape, don’t hesitate to call or email. We love talking about this stuff and are always glad to freely provide any information that can help you out.